Hello and welcome to Sterling Dragonfly! 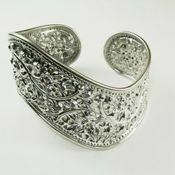 I have a great passion for Sterling silver jewelry, I have since I was a teen. So here I am offering mostly hand-crafted exotic items from around the world. I have had a wide variety of jobs, Retail Manager of a dress shop for 16 years, Dental Radiologist, a Contact lens specialist, assisting in eye surgury and worked in banking. I enjoy Gardening a great deal, I have a large rock collection,a huge cook book collection and love cooking international foods of all types and I play the Native American Flute. I love old vintage and antique items and have started a collection of pottery and books. My husband and I enjoy hiking in the NC Mtns. and we have a Kayak that we use when time allows. Most of all, I have a very special Kitty that I love more than life with me in spirit at all times. I hope you enjoy looking around the store and appreciate the artistry that was put into the hand-crafted Jewelry from places like India, Bali and New Zealand. Some of the pieces are so intricate that even the backs are decorated. The Bali jewelry pieces are good thick solid items that will last a life time and can be handed down through the family. sterlingdragonfly doesn't have any items in their booth! She is a true asset to the Bonanzle Community. She sells quality and beautiful items and goes above and beyond in all of her communications. She is generous and caring and I am proud to know this exceptional person. Sterling is one of the very nicest people you will ever meet! She is a Wonderful Seller and Buyer! Here handmade jewelry is gorgeous and her taste impeccable. I have found her to be an absolute pleasure. What an awesome addition to Bonanzle. We are so lucky to have her here! Sterlingdragonfly is a well known and active member of the Bonanzle community. She is one of the most pleasant and helpful people that I have had the pleasure to meet on Bonanzle. I would never have any doubt in making a purchase from Sterlingdragonfly and would be confident in her honesty. A great person with BEAUTIFUL products! Shipping was fast and the product was 1st class! Thanks sterling! She is one of the nicest and most caring people online ! Thank you ! Sterlingdragonfly is a valued seller at Bonanzle and here is why: The transaction was perfect! Excellent prices, great communication, fast deliver and the product is absolutely beautiful and of high quality! First rate seller! I am soo looking forward to ordering some jewelry from you! I love Onyx and Sterling and you carry them both! Excellent Bonanzler! Fast payment and great communication. Deal with confidence. A super asset to the Bonanzle community! A++! What a fantastic person and a valued member of Bonanzle. This is a must see booth expect the best in customer service as that is what you will find here. Beautiful selection of quality jewelry from a seller with 100 Percent feedback . Honest, honest, honest. ! !